This is a political book... It has a political purpose: to strengthen the will to maintain freedom against the threat of its abandonment in favor of totalitarianism. The most dangerous and at the same time most stupid explanation of fascism is the propaganda theory. In the first place, I have never been able to find anyone who could reconcile it with the fact that right up to the fascist victory—and in Italy beyond it—literally all means of propaganda were in the hands of uncompromising enemies of fascism. There was not one widely-read newspaper but poured ridicule on Hitler and Mussolini while the Nazi and the fascist press were unread and on the verge of bankruptcy. The radio in Germany, owned by the government, issued one anti-Nazi broadside after the other. More powerful than both, the established churches used all the enormous direct influence of the pulpit and the confessional to fight fascism and Nazism. [T]he ‘total state’ of fascism is not a political alignment within the existing political and social setup, but that it is a revolution which, like all revolutions, works from without. Of course, every revolution repudiates what went on before and considers itself a conscious break with the past; it is only posterity that sees, or imagines it sees, the historical continuity. Fascism, however, goes much further in its negation of the past than any earlier political movement, because it makes this negation its main platform. What is even more important, it denies simultaneously ideas and tendencies which are in themselves antithetic. The Nazi agitator whom, many years ago, I heard proclaim to a wildly cheering peasants’ meeting: ‘We don’t want lower bread prices, we don’t want higher bread prices, we don’t want unchanged bread prices—we want National-Socialist bread prices,’ came nearer explaining fascism than anybody I have heard since. Of these denials of European tradition one is especially important: that is the refutation of the demand that the political and social order and the authority set up under it have to justify themselves as benefiting their subjects. Hardly any other concept or idea of our past is held up to so much ridicule by fascism as that of the justification of power. ‘Power is its own justification’ is regarded as self-evident. Nothing shows better how far the totalitarian revolution has already gone than the general acceptance of this new maxim throughout Europe as a matter of course… Not even the most fanatical advocates of absolute monarchy would have dared to justify the sovereign otherwise. Equally striking is the fact that racial anti-Semitism was not taken seriously even by the great majority of Nazis. ‘It is just a catchword to attract voters’ was a standing phrase which everybody repeated and believed, and that I took it seriously was more than once regarded as definite proof of my stupidity and gullibility. [The masses] … must turn their hopes toward a miracle. In the depths of their despair reason cannot be believed, truth must be false, and lies must be truth. "Higher bread prices," "lower bread prices," "unchanged bread prices" have all failed. The only hope lies in a kind of bread price which is none of these, which nobody has ever seen before, and which belies the evidence of one's reason. In addition, profits are so completely subordinated in Germany and Italy to requirements of a militarily conceived national interest and of full employment that the maintenance of the profit principle is purely theoretical. Profits have lost their autonomy as an independent, not to say the supreme, goal of economic activity. There is a definite trend in Italy and Germany to eliminate profit participation and the ownership rights of nonmanaging partners and shareholders. The regimentation of agriculture was in both fascist countries the first, and for a considerable time the most drastic, intervention in the free play of economic forces. In either country, and especially in Germany, the threat of the industrial revolution in agriculture had reached a point at which government intervention in the social structure of farming was entirely unavoidable. Actually, the specter of the Russo-German alliance is already the nightmare of every European government, however much they protest their belief in the inevitability of a Russo-German war. And what is only a nightmare today may be reality tomorrow. The two regimes will have to come together because they are similar ideologically and socially. That the European Left has not dared to admit this is understandable. By conceding that Soviet Russia is as fascist a state as Germany, they would have conceded that socialism must fail and would have abandoned themselves. In the modern corporation the decisive power, that of the managers, is derived from no one but the managers themselves controlled by nobody and nothing and responsible to no one. It is in the most literal sense unfounded, unjustified, uncontrolled and irresponsible power. That the government's power under the Taft-Hartley Act to stop a strike by injunction so clearly strengthens the hand of the employer--even though it is used only when a strike threatens the national health, welfare, or safety--is a grave blemish and explains much of union resistance to the Act. We still think and talk of the basic problems of an industrial society as problems that can be solved by changing the system, that is the superstructure of political organization. Yet the real problems lie within the [industrial] enterprise. ...our representative institution... a mirror in which we look when we want to see ourselves. What the worker needs is to see the plant as if he were a manager. Only thus can he see his part, from his part he can reach the whole. This "seeing" is not a matter of information, training courses, conducted plant tours, or similar devices. What is needed is the actual experience of the whole in and through the individual's work. It does not matter whether the worker wants responsibility or not, ...The enterprise must demand it of him. The fundamental reality for every worker, from sweeper to executive vice-president, is the eight hours or so that he spends on the job. In our society of organizations, it is the job through which the great majority has access to achievement, to fulfillment, and to community. - A manager sets objectives - A manager organizes - A manager motivates and communicates - A manager, by establishing yardsticks, measures - A manager develops people. Peter F. Drucker, Landmarks of Tomorrow: A Report on the New 'Post-Modern' World, New York: Harper & Row, 1959. We no longer even understand the question whether change is by itself good or bad, ...We start out with the axiom that it is the norm. We do not see change as altering the order... We see change as being order itself--indeed the only order we can comprehend today is a dynamic, a moving, a changing one. In the political, the social, the economic, even the cultural sphere, the revolutions of our time have been revolutions "against" rather than revolutions "for"… On the whole throughout this period the man--or party--that stood for doing the positive has usually cut a pathetic figure; well meaning but ineffectual, civilized but unrealistic, he was suspect alike to [by both] the ultras of destruction and the ultras of preservation and restoration. Through systematic terror, through indoctrination, through systematic manipulation of stimulus, reward, and punishment, we can today break man and convert him into brute animal... The first step toward survival is therefore to make government legitimate again by attempting to deprive it of these powers... by international action to ban such powers. The citizen of 1900 if employed worked for a small family-type operation; the small pop-and-mom store employing a helper or two; the family household; and so on. And of course, the great majority of people in those days, except in the most highly industrialized countries—such as Britain or Belgium—worked on the farm. We will have to learn to lead people rather then to contain them. The prevailing economic theory of business enterprise and behavior, the maximization of profit—which is simply a complicated way of phrasing the old saw of buying cheap and selling dear—may adequately explain how Richard Sears operated. But it cannot explain how Sears, Roebuck or any other business enterprise operates, nor how it should operate. The concept of profit maximization is, in fact, meaningless. Decisions exist only in the present. Note: see W Edwards Deming "Blame the process, not the people." A success that has outlived its usefulness may, in the end, be more damaging than failure. One cannot hire a hand; the whole man always comes with it. "Loafing" is easy, but "leisure" is difficult. An employer has no business with a man's personality. Employment is a specific contract calling for a specific performance... Any attempt to go beyond that is usurpation. It is immoral as well as an illegal intrusion of privacy. It is abuse of power. An employee owes no "loyalty," he owes no "love" and no "attitudes"--he owes performance and nothing else. .... The task is not to change personality, but to enable a person to achieve and to perform. The society of ]]organizations\\ is new-only seventy years ago employees were a small minority in every society. [[Management] has authority only as long as it performs. We do not need more laws. No country suffers from a shortage of laws. We need a new model. The worker's effectiveness is determined largely by the way he is being managed. One has to make a decision when a condition is likely to degenerate if nothing is done. Communication is always "propaganda." The emitter always wants "to get something across." The tool user, provided the tool is made well, need not, and indeed should not, know anything about the tool. Top management as a function and as a structure was first developed by Georg von Siemens (1839-1901) in Germany between 1870 and 1880, when he designed and built the Deutsche Bank and made it, within a very few years, into continental Europe's leading and most dynamic financial institution. Engineers speak half–jokingly about Murphy's Law: " If anything can go wrong, it will." But complexity stands under a second law as well. Let me call it Drucker's law: "If one thing goes wrong, everything else will, and at the same time." Financial "synergy" is a will-o'-the-wisp.It looks good on paper, but it fails to work out in practice. Organizationally what is required - and evolving - is systems management. For the social ecologist language is not "communication." It is not just "message." It is substance. It is the cement that holds humanity together. It creates community and communication. ...Social ecologists need not be "great" writers; but they have to be respectful writers, caring writers. That people even in well paid jobs choose ever earlier retirement is a severe indictment of our organizations -- not just business, but government service, the universities. These people don't find their jobs interesting. ...what's absolutely unforgivable is the financial benefit top management people get for laying off people. There is no excuse for it. No justification. This is morally and socially unforgivable, and we will pay a heavy price for it. Knowing Yourself ...We also seldom know what gifts we are not endowed with. We will have to learn where we belong, what we have to learn to get the full benefit from our strengths, where our weaknesses lie, what our values are. We also have to know ourselves temperamentally: "Do I work well with people, or am I a loner? What am I committed to? And what is my contribution?" ...the information revolution. Almost everybody is sure ...that it is proceeding with unprecedented speed; and ...that its effects will be more radical than anything that has gone before. Wrong, and wrong again. Both in its speed and its impact, the information revolution uncannily resembles its two predecessors ...The first industrial revolution, triggered by James Watt's improved steam engine in the mid-1770s...did not produce many social and economic changes until the invention of the railroad in 1829 ...Similarly, the invention of the computer in the mid-1940s, ...it was not until 40 years later, with the spread of the Internet in the 1990s, that the information revolution began to bring about big economic and social changes. ...the same emergence of the “super-rich” of their day, characterized both the first and the second industrial revolutions. ...These parallels are close and striking enough to make it almost certain that, as in the earlier industrial revolutions, the main effects of the information revolution on the next society still lie ahead. This new knowledge economy will rely heavily on knowledge workers. ...the most striking growth will be in “knowledge technologists:” computer technicians, software designers, analysts in clinical labs, manufacturing technologists, paralegals. ...They are not, as a rule, much better paid than traditional skilled workers, but they see themselves as “professionals.” Just as unskilled manual workers in manufacturing were the dominant social and political force in the 20th century, knowledge technologists are likely to become the dominant social—-and perhaps also political—-force over the next decades. Once a year ask the boss, "What do I or my people do that helps you to do your job?" and "What do I or my people do that hampers you?" The subordinate's job is not to reform or reeducate the boss, not to make him conform to what the business schools or the management book say bosses should be like. It is to enable a particular boss to perform as a unique individual. Never underrate the boss! The boss may look illiterate. He may look stupid. But there is no risk at all in overrating a boss. If you underrate him he will bitterly resent it or impute to you the deficiency in brains and knowledge you imputed to him. The postwar [WWII] GI Bill of Rights - and the enthusiastic response to it on the part of America's veterans - signaled the shift to the knowledge society. Future historians may consider it the most important event of the twentieth century. We are clearly in the midst of this transformation; indeed, if history is any guide, it will not be completed until 2010 or 2020. But already it has changed the political, economic and moral landscape of the world. That knowledge has become the resource, rather than a resource, is what makes our society "post-capitalist. In the 1950s, industrial workers had become the largest single group in every developed country, and unionized industrial workers in mass-production industry (which was then dominant everywhere) had attained upper-middle-class income levels. They had extensive job security, pensions, long paid vacations, and comprehensive unemployment insurance or "lifetime employment." Above all, they had achieved political power... Thirty-five years later, in 1990, industrial workers and their unions were in retreat. They had become marginal in numbers. Whereas industrial workers who make or move things had accounted for two fifths of the American work force in the 1950s, they accounted for less than one fifth in the early 1990s--that is, for no more than they had accounted for in 1900, when their meteoric rise began... By the year 2000 or 2010, in every developed free-market country, industrial workers will account for no more than an eighth of the work force. Union power has been declining just as fast... By the year 2000 or 2010, in every developed free-market country, industrial workers will account for no more than an eighth of the work force. Union power has been declining just as fast. The newly emerging dominant group is "knowledge workers." The very term was unknown forty years ago. (I coined it in a 1959 book, Landmarks of Tomorrow.) By the end of this century knowledge workers will make up a third or more of the work force in the United States--as large a proportion as manufacturing workers ever made up, except in wartime. The majority of them will be paid at least as well as, or better than, manufacturing workers ever were. And the new jobs offer much greater opportunities. Increasingly, politics is not about "who gets what, when, how" but about values, each of them considered to be absolute. Politics is about "the right to life"...It is about the environment. It is about gaining equality for groups alleged to be oppressed...None of these issues is economic. All are fundamentally moral. 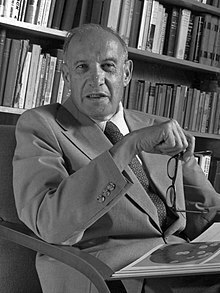 The publication of Peter F. Drucker's The Practice of Management in 1954 was a turning point in the development of the discipline of management.